All of us at one stage started somewhere in our carp fishing lives, and I think that it is sometimes easy to forget that there are beginners coming to the sport all of the time. Recently we have seen many people starting Carp fishing who have not had an apprenticeship from catching skimmers as a child under a father’s watchful eye to later, migrating to carp or another specimen species. This leads beginners to wonder “ where do I start ?” and often they start by pouring through the magazines for the latest wizz bang rig that uses £8 of swivels and tubing and then they end up blanking. They blank not through lack of enthusiasm but because they didn’t have the confidence to realize that simple is most likely better. Some of the rigs you see in the magazines have been designed for really specialized applications that 99% of us will never see. The cynic in me also suspects that they are to sell magazines and tackle :). 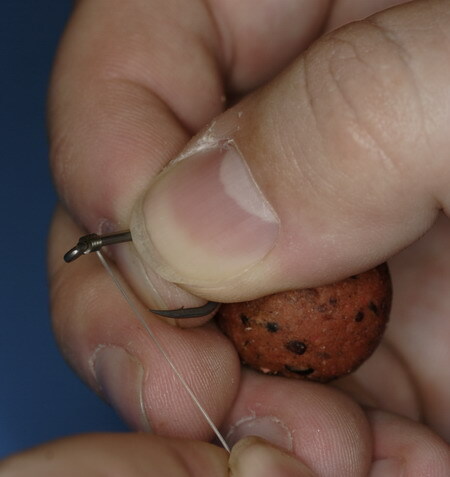 Carp fishing is all about confidence, confidence in your bait, tackle and rigs, in this article I want to cover some really basic rigs that I wish that I had known when I started carping some 24 years ago ( though with a 10 year break). A lot of what you will see here might have been covered by other anglers but I want to boil the rigs down to the very essence of what they need to be. Once you have gotten experience with these rigs feel free to move onto other more complicated rigs as if you have the basics right then you can’t go too far wrong. I know that this is not an exhaustive list but if you are starting carp fishing and want to know where to start this is a good place. 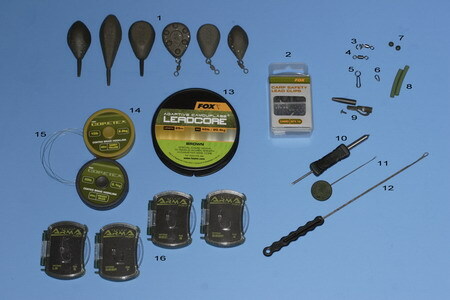 The picture below shows some standard components that I would expect all carp anglers to have in some form or another, manufacturers might vary but the components are the same. Lead clips, always get them from a reputable manufacturer rather than shop own brands. This rig is the 1st rig I would start with, there are no fancy components needed and once mastered you can also swap to fluro carbon or any other hook link materials. At is heart is the knotless knot which since its development has revolutionized carp fishing almost as much as the hair rig. Almost every rig you see today uses this knot in some form. 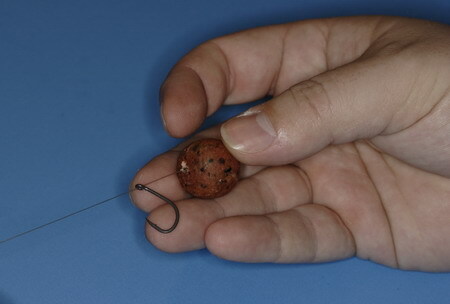 Firstly start by identifying the size of bait that you will be using on the rig. Size of boat affects both hook size and hair length. In the picture below you can see a selection of boillies a 20mm, a 15mm and on the far right a 10mm. 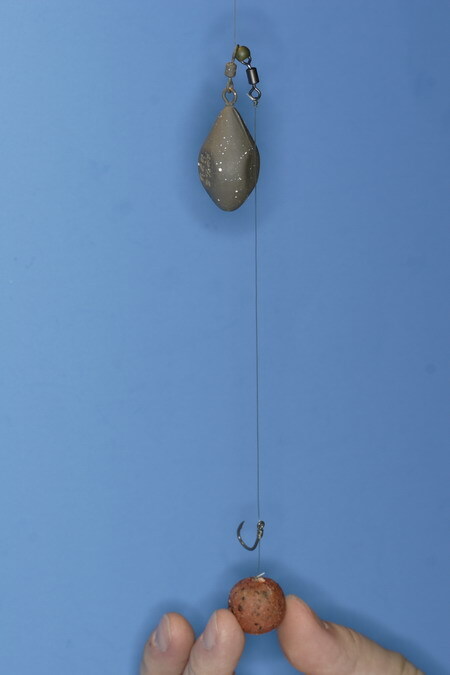 It is easy to see that if you swap bait size you will also need to swap hook size and hence rig. This does not need to be a figure of 8 knot as it will not be load bearing and so a simple granny knot will do. 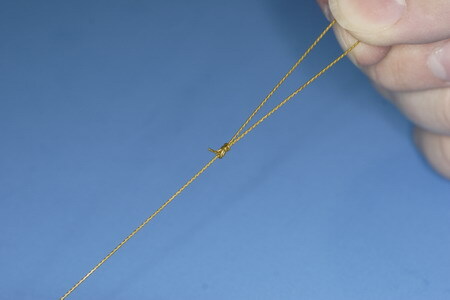 Pull this knot tight with you tension bar or equivalent. 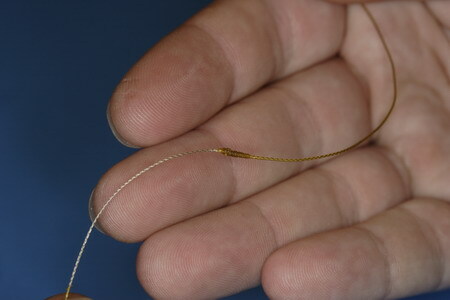 Trim the tag end and put a boillie on with a baiting needle. It is important that this boillie is the same size as you would be using with the finished rig. Next take your chosen hook, in this case a size 4 Fox SSBP which perfectly matches a 20mm bottom bait and due to the slightly in turned eye gives a lovely almost “bent hook” effect to the rig. Position the hook at the correct location on the mono allowing for your chosen distance between the bottom of the hook bend and the bait. I like to set this distance to be about 5mm which I feel allows the bait to move effectively whilst avoiding the tangles that can occur with longer hairs. 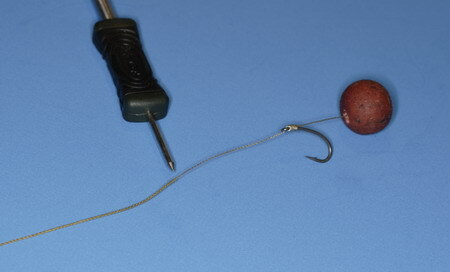 Trapping the mono to form the correct length of hair start to whip the mono up the shank of the hook from the eye. There has been a lot of discussion about how many turns to whip but I personally think that as long as you go for more than 7 you are fine. 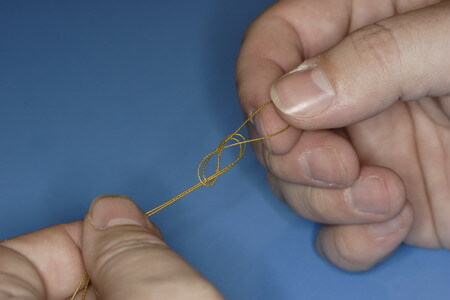 Once you have whipped the desired number of turns (in this case 10 turns), take the line and thread it back through the eye of the hook from the top so that the line emerges from the bottom nearest the point. Congratulations you have now tied a knotless knot ! The method is exactly the same no matter what material you are tying it with be it, mono, fluorocarbon or some type of braid. Next tie a swivel on to the other end of the hook link. I use a 5 turn trilene knot which is very similar to a blood knot but you pass the line through the eye twice. 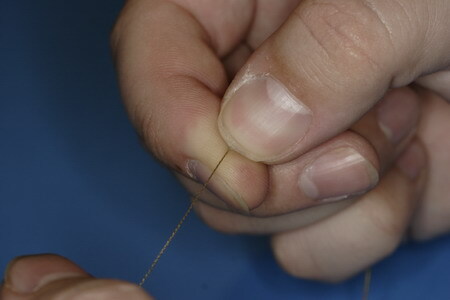 So to start the knot, thread the line through twice and keep the loop open. I find that if I stick my thumb through the loop it works the best. 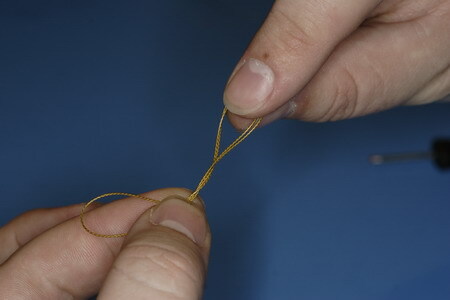 Take the tag end and pass it round the main link 5 times and then pass it through the loop formed by passing the line twice through the swivel eye, moisten and pull tight. 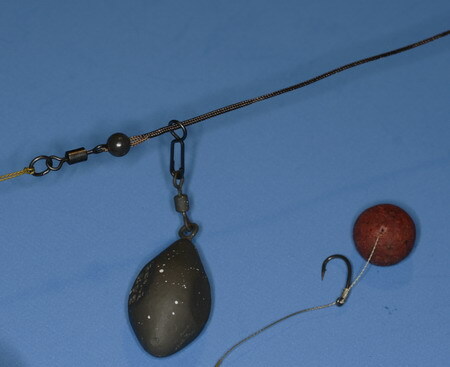 This running ledger rig with the exception of the knotless knot has been used for almost hundreds of years in one guide or another and can not be beaten if you are fishing close range or you are stalking. If you are just starting carp fishing (or any other kind of specimen fishing such as tench or bream) this is the rig I would recommend you stick to at the beginning. It is simple and affective and allows you to concentrate on more important things such as watercraft and bait placement. 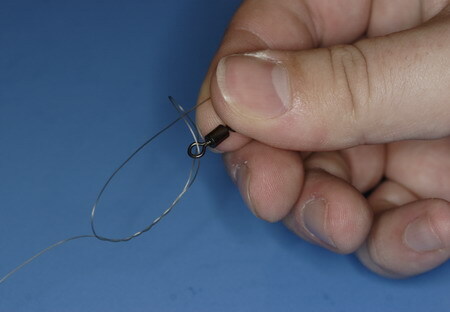 The running monofilament rig is simple but it has one issue, it can tangle quite easily and the stiff mono can make the bait behave unnaturally in the water which may or may not be what you are after. 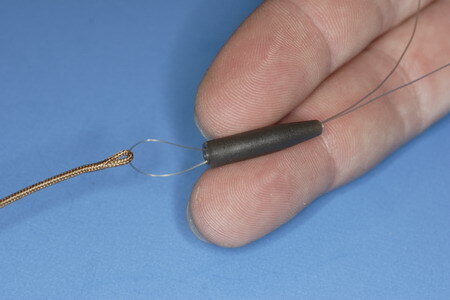 Once you have more confidence in your rigs and rig making ability I would recommend you can use one of the coated braids should you want to eliminate potential tangles as well as have a softer hook link. 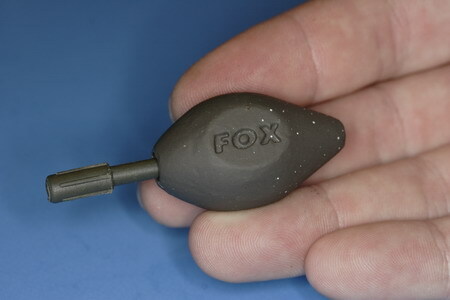 For this example I am going to use Fox cortex in 15lbs breaking strain. It is a good representation of the kinds of modern coated braids that are around today. Start by cutting off a piece about 40 Cm long and stripping off the coating for about 10 cm from one end. In the above picture you can see the coating partially stripped from the braid. Continue stripping until you have a 10 cm section at one end that is free from coating. 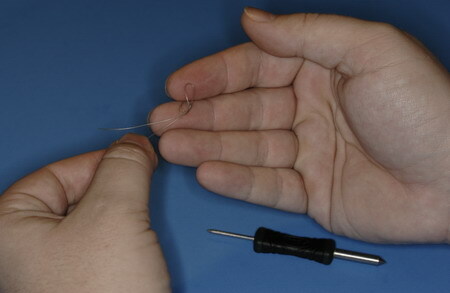 Next repeat the steps I showed you in the monofilament rig with a small hair loop, thread on a boillie, set the hair length and finally tie a knotless knot. The tension bar is pointing to the end of the stripped back section. 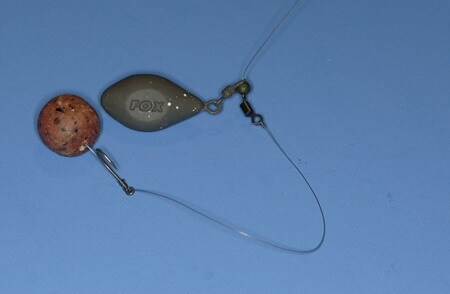 Notice also that as I have chosen to use a 15mm boillie I have swapped hook size to a size 8 Fox SSC. As the braid is more supple than the monofilament I prefer the SSC as it is more curved. This I feel offers a far better hooking angle than a straight hook. Next to finish the other end of the rig. Then before passing the end of the loop through the loop you just formed twist the new loop round 1 turn as in the picture above. Finally pass the loop through the twisted loop and you will see that the line now forms a number 8. 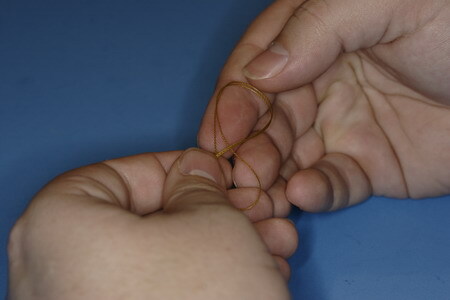 If it doesn’t start again, the knot strength of a figure of 8 loop is far greater than a granny knot or over hand loop. Moisten the knot and pull tight, then trim the tag end. Congratulate yourself as you can now tie 2 of the rigs that I guarantee have taken most of the carp swimming today, no matter what the magazines tell you. This rig was shown at the end of the mono hook link rig and I want to expand upon it here to show what can be done to solve the tangle issue by adding Lead core. Everything I am about to show can be done with tubing should your lake have a lead core ban. As all of the ones I fish don’t I will continue to use it as I prefer lead core to tubing just for simplicities sake. I will not cover lead core splicing here as there are several other articles on the subject and if you don’t feel confident you can buy lead core leaders ready made. 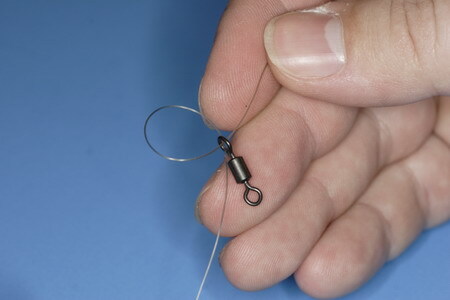 In order to fish the rig with a free running lead simply attach your rig to the ring swivel with a loop to loop knot ( see later) thread on a bead and then your running lead clip ( item number 5 in the components). 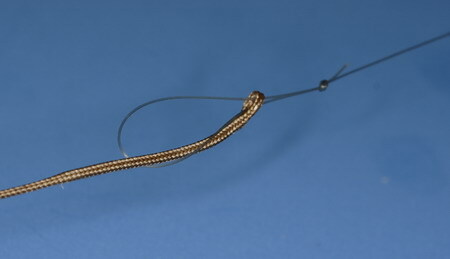 Attach the lead core to your main line (see later) and you are done. The rig is simple, effective, doesn’t tangle and is 100% carp safe. If you snap the line the lead will simply fall off. There has been much controversy surrounding bolt or fixed leads. They have been heavily demonized which is unfair as a modern lead clip will eject the lead every time. I would strongly suggest only buying big name branded clips, some of the “shops own brand” clips have been in my experience slightly less effective. 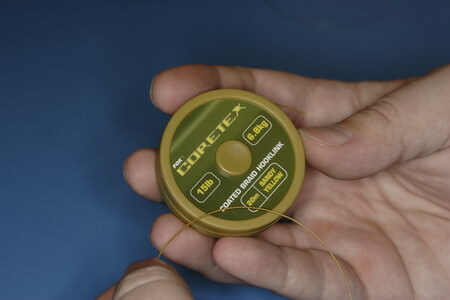 As we will fish this one with lead core, we start by taking the lead clip and threading it on to the lead core. This can be tricky and a little tip is to thread a piece of stiff mono through the clip, then through the loop in the lead core, and then back through the clip. You can then slide the clip straight down the loop of line and on to the lead core. 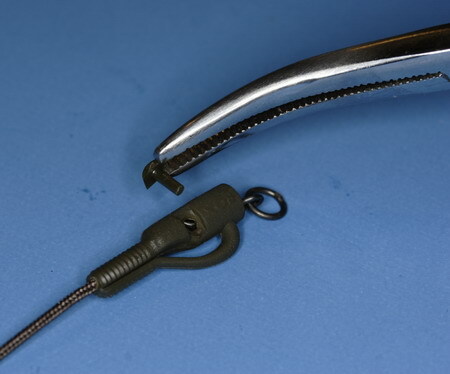 Once you have pulled the clip down onto the swivel it is critical that the little peg that is provided is placed into the recess in the main lead clip body. The next job is to thread the tail rubber for the lead clip onto the lead core, this can be done with a closed latch baiting needle or using the piece of mono I mentioned earlier. Next put a lead on to the clip and after moistening the ridged back section of the clip, put the tail rubber on. It is important to only put it on half way as the clip might not eject as easily otherwise. 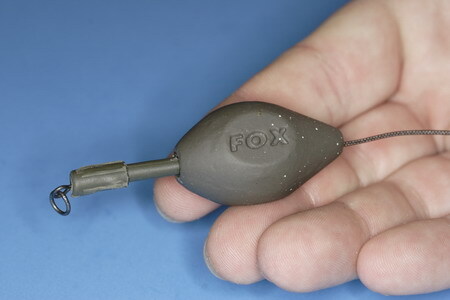 It is also critical to check the tail rubber after each fish and each carp, it will work loose and if you don’t check it (as I have failed to do several times) the lead will either eject on the cast or eject as it hits the water. One of these scenarios is embarrassing and one could be dangerous if a flying lead were to hit someone. I have never had a “flying lead incident” happen or heard it happen but it is good to be careful. Put your hook link on and you are read to go. If you want to tie this with tubing instead of lead core, simply thread the tubing onto your line, then the tail rubber and finally the lead clip. Tie on the ring swivel, pull the lead clip over the back of the ring swivel and place in the peg. Put on the lead, pull the tail rubber on and push the tubing into the back of the tail rubber. Inline leads are perhaps the ultimate in an anti tangle setup and fly very well if you need distance. 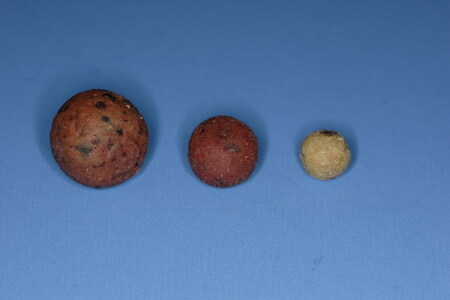 They are available in kinds of shapes and sizes to suit the lake / river bottom and the marketing departments of major tackle developers (only joking). See the initial components picture for a small selection of the patterns available. First we need to start by removing the central rubber tube from the center of the lead. This can be tricky but a pair of forceps can be useful especially of the lead is brand new. 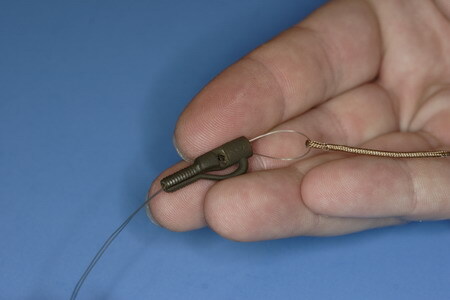 Next using the mono trick above, thread the center rubber onto the lead core and pull it down to the swivel. Next thread the lead down the lead core and pull it over the center rubber. 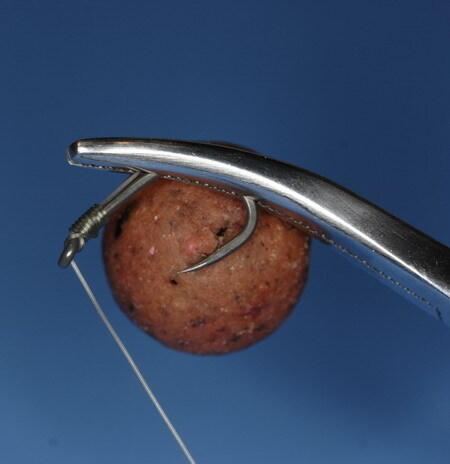 Attach your rig to the ring on the swivel on the lead core and you are ready. 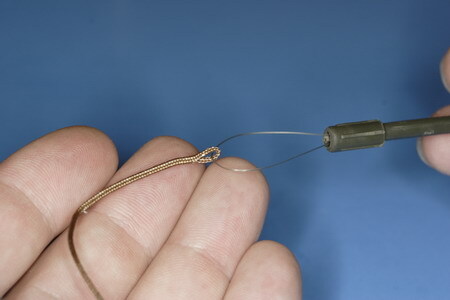 If you want to fish this with tubing simply thread the tubing on you mainline, thread the lead and center rubber as normal. Tie the mainline to the swivel and pull the tubing into the back of the center rubber. Attaching lead core to main line. There are many ways of attaching lead core to mainline however I prefer a simple loop to loop knot. It is easy to tie and can be tied in the dark in a force 8 gale with the rain pouring in your face. 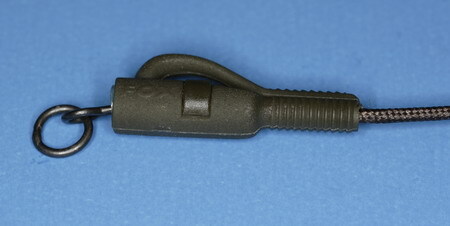 To attach the lead core, tie a figure of 8 loop (see above) in your main line. Push this loop through the loop in the end of your lead core and then drop the rig, lead and lead core through the loop. As long as all of the components threaded on the lead core can pass over the figure of 8 on the mainline you are fine. 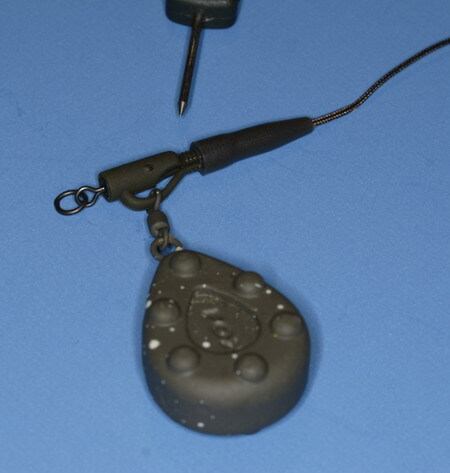 Just like bollie flavours some rigs are designed to catch the angler rather than the carp. By keeping to simple rigs that you have full confidence in you will increase your catch rate and you will enjoy your fishing more. You want to buy fewer quantities of end tackle but better quality, trust me quality counts then it comes to hooks, swivels etc. I’m just beginning to fish and found this article very usual, many thanks for posting it. many thanks for posting this item,its very informative easy to follow.again many thanks. Trawled and trawled the net for an “idiots guide” and so far this has been the most usefull, thank you. fingers crossed for some tight lines. Thanks for this – I’ve found the books, magazines and dvd’s assume a lot of knowledge which for the beginner, isn’t there!! This was perfect – well done. Great advice to someone starting to get serious again now i have retired. Great article for beginners with good details. Thanks to the writer for this point to point assemble of the rig. Surely will help lots of newbies. Thanks for sharing. Brilliant article. very well laid out and explained. thank you very much just given me a huge confidence boost. Any Chance you could post the original PDF as well? its a very usefull guide and I would like to put it on my tablet PC that I take fishing with me. Many thanks for this, because if you’ve never done carp fishing before,where do you start?at the beginning and this is spot on. I am a novice carp angler and found this article very helpful. Has given me a lot of confidence regards safe end rigs that are simple, safe and effective.